Quintessential navy village, centred on the activities of those who are members of the South African Navy and other nautical enthusiasts alike, Simons Town is situated along the stretch of coast between Cape Town and the world-renowned Cape Point Nature Reserve, on the shores of False Bay, and neighbours the little towns of Fishhoek and Kalk Bay, which are contiguous with the Mother City of Cape Town. The charm of Simons Town lies in its history, which permeates the architecture, monuments and famous tales of yesteryear that have been handed down from one generation to the next. False Bay became the favoured spot for ships to arrive as Table Bay was subject to violent winds, causing many shipwrecks. Simon van der Stel selected this part of the coast to anchor, sheltered from the powerful gales. However, because it is quite some distance from Cape Town (certainly back then), it remained a fairly quiet bay, with most seamen risking the more convenient Table Bay. Over time, as French, British and Dutch settlers arrived, Simon’s Town and its bay experienced various occupations and upheavals as different entities tried to lay claim to the land and water. In the early 1800’s, the whole naval base was moved from Table Bay to Simonstown for the first time. Today, the streets are lined with museums, buildings that have an architectural design that dates back more than 150 years, unique speciality shops, and restaurants with world-class cuisine and stunning views of the ocean. Simon’s Town is just over 44 kilometres from the CBD of Cape Town. 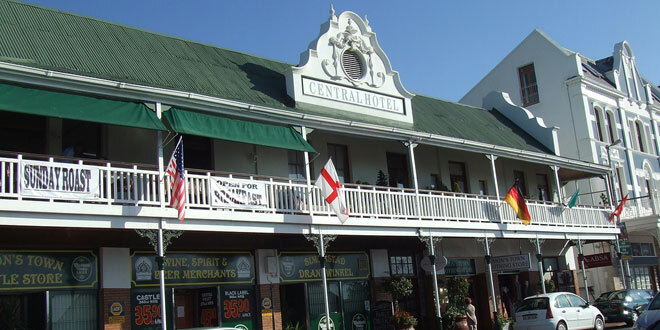 The Simon’s Town Historical Mile in St George’s Street is a treasure trove of history and culture. South African Naval Museum – situated in the original dockyard, this includes the mast house, sail loft, boat shed, rigging shop, storehouse, and St George’s Church. The exhibition comprises submarine models, ship models, a life-size submarine control room, naval guns and torpedoes, small craft, mine-sweeping equipment, sea mines, diving equipment, and more. Warrior Toy Museum & Collectors’ Shop – for little ones and the young-at-heart, this museum showcases model cars, trains and boats; aeroplanes; dinky toys; dolls; and Meccano products. Mosque – dating back to 1926. Dido Valley Cemetery – where the beautiful gravestones have the distinctive scarring of decades of salty sea air and wind. Studland – built as a tavern in 1897, this is the oldest building of its kind in the country. Just Nuisance is a massive part of Simons Town’s history. Find the bronze statue of this famous Great Dane and learn all about this important member of the naval family.